Labrador Retriever Care Tips " "
Labrador Retriever care isn’t difficult, especially when you make it a regular part of your routine. This includes providing your dog with the necessary grooming he needs in order to remain healthy. What type of grooming is involved with Labrador Retriever care? Of all the grooming necessities listed above, the one that you need to pay the most attention to in regards to Labrador Retriever care is ear checks. This is because Labs are prone to ear infections due to their folded ears. When a dog’s ears do not stick straight up, they do not receive the same air circulation, which can sometimes lead to excess moisture and build up of bacteria in the ear. This can cause ear infections which can be painful and even result in loss of hearing if left untreated – or worse – treated incorrectly. You will notice if your Lab’s ears are bothering him. He will likely scratch his ears frequently, or constantly shake his head. When you lift his ears, you will notice a foul odor, possible redness in the skin and possibly wax. First, make sure you check your Lab’s ears twice every month. The skin should be a pale pink. If you notice red, brown or black skin, or a foul odor, take your dog to the Vet and have him checked out. Follow all of the Vet’s instructions if your dog is provided medication for his condition. If your dog’s ears are clean, moisten a cotton ball (not a q-tip!) with warm water or mineral oil. Use the cotton ball to clean the flaps of his ears, and the opening to the canal. Never probe deep into your dog’s canal. This can result in pushing wax further into the ear, which can lead to infection. Labrador Retriever care is not rocket science, and when you do it regularly, you will find it’s far less time consuming and easier than you thought. Have your family to help out, and it won’t be long until your Lab is used to being cared for. He may actually enjoy most of it! 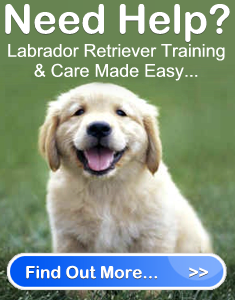 Labrador Retriever Care Tips	Overall rating:	4.8	out of 5 based on 64	reviews.